Bishop of Alexandria; Confessor and Doctor of the Church; born c. 296; died 2 May, 373. 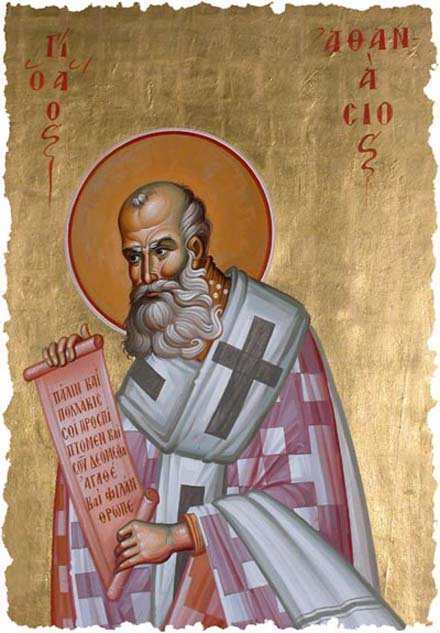 Athanasius was the greatest champion of Catholic belief on the subject of the Incarnation that the Church has ever known and in his lifetime earned the characteristic title of “Father of Orthodoxy”, by which he has been distinguished every since. While the chronology of his career still remains for the most part a hopelessly involved problem, the fullest material for an account of the main achievements of his life will be found in his collected writings and in the contemporary records of his time. He was born, it would seem, in Alexandria, most probably between the years 296 and 298. An earlier date, 293, is sometimes assigned as the more certain year of his birth; and it is supported apparently by the authority of the “Coptic Fragment” (published by Dr. O. von Lemm among the Mémoires de l’académie impériale des sciences de S. Péterbourg, 1888) and corroborated by the undoubted maturity of judgement revealed in the two treatises “Contra Gentes” and “De Incarnatione”, which were admittedly written about the year 318 before Arianism as a movement had begun to make itself felt. It must be remembered, however, that in two distinct passages of his writings (Hist. Ar., lxiv, and De Syn., xviii) Athanasius shrinks from speaking as a witness at first hand of the persecution which had broken out under Maximian in 303; for in referring to the events of this period he makes no direct appeal to his own personal recollections, but falls back, rather, on tradition. Such reserve would scarcely be intelligible, if, on the hypothesis of the earlier date, the Saint had been then a boy fully ten years old. Besides, there must have been some semblance of a foundation in fact for the charge brought against him by his accusers in after-life (Index to the Festal Letters) that at the times of his consecration to the episcopate in 328 he had not yet attained the canonical age of thirty years. These considerations, therefore, even if they are found to be not entirely convincing, would seem to make it likely that he was born not earlier than 296 nor later than 298. It is impossible to speak more than conjecturally of his family. Of the claim that it was both prominent and well-to-do, we can only observe that the tradition to the effect is not contradicted by such scanty details as can be gleaned from the saint’s writings. Those writings undoubtedly betray evidences of the sort of education that was given, for the most part, only to children and youths of a better class. It began with grammar, went on to rhetoric, and received its final touches under some one of the more fashionable lecturers in the philosophic schools. It is possible, of course, that he owed his remarkable training in letters to his saintly predecessor’s favour, if not to his personal care. But Athanasius was one of those rare personalities that derive incomparably more from their own native gifts of intellect and character than from the fortuitousness of descent or environment. His career almost personifies a crisis in the history of Christianity; and he may be said rather to have shaped the events in which he took part than to have been shaped by them. Yet it would be misleading to urge that he was in no notable sense a debtor to the time and place of his birth. The Alexandria of his boyhood was an epitome, intellectually, morally, and politically, of that ethnically many-coloured Graeco-Roman world, over which the Church of the fourth and fifth centuries was beginning at last, with undismayed consciousness, after nearly three hundred years of unwearying propagandism, to realize its supremacy. It was, moreover, the most important centre of trade in the whole empire; and its primacy as an emporium of ideas was more commanding than that of Rome or Constantinople, Antioch or Marseilles. Already, in obedience to an instinct of which one can scarcely determine the full significance without studying the subsequent development of Catholicism, its famous “Catechetical School”, while sacrificing no jot or tittle or that passion for orthodoxy which it had imbibed from Pantaenus, Clement, and Origen, had begun to take on an almost secular character in the comprehensiveness of its interests, and had counted pagans of influence among its serious auditors (Eusebius, Hist. Eccl., VI, xix). To have been born and brought up in such an atmosphere of philosophizing Christianity was, in spite of the dangers it involved, the timeliest and most liberal of educations; and there is, as we have intimated, abundant evidence in the saint’s writings to testify to the ready response which all the better influences of the place must have found in the heart and mind of the growing boy. Athanasius seems to have been brought early in life under the immediate supervision of the ecclesiastical authorities of his native city. Whether his long intimacy with Bishop Alexander began in childhood, we have no means of judging; but a story which pretends to describe the circumstances of his first introduction to that prelate has been preserved for us by Rufinus (Hist. Eccl., I, xiv). The bishop, so the tale runs, had invited a number of brother prelates to meet him at breakfast after a great religious function on the anniversary of the martyrdom of St. Peter, a recent predecessor in the See of Alexandria. While Alexander was waiting for his guests to arrive, he stood by a window, watching a group of boys at play on the seashore below the house. He had not observed them long before he discovered that they were imitating, evidently with no thought of irreverence, the elaborate ritual of Christian baptism. (Cf. Bunsen’s “Christianity and Mankind”, London, 1854, VI, 465; Denzinger, “Ritus Orientalium” in verb. ; Butler’s “Ancient Coptic Churches”, II, 268 et sqq. ; “Bapteme chez les Coptes”, “Dict. Theol. Cath.”, Col. 244, 245). He therefore sent for the children and had them brought into his presence. In the investigation that followed it was discovered that one of the boys, who was no other than the future Primate of Alexandria, had acted the part of the bishop, and in that character had actually baptized several of his companions in the course of their play. Alexander, who seems to have been unaccountably puzzled over the answers he received to his inquiries, determined to recognize the make-believe baptisms as genuine; and decided that Athanasius and his playfellows should go into training in order to fit themselves for a clerical career. The Bollandists deal gravely with this story; and writers as difficult to satisfy as Archdeacon Farrar and the late Dean Stanley are ready to accept it as bearing on its face “every indication of truth” (Farrar, “Lives of the Fathers”, I, 337; Stanley, “East. Ch.” 264). But whether in its present form, or in the modified version to be found in Socrates (I, xv), who omits all reference to the baptism and says that the game was “an imitation of the priesthood and the order of consecrated persons”, the tale raises a number of chronological difficulties and suggests even graver questions. Perhaps a not impossible explanation of its origin may be found in the theory that it was one of the many floating myths set in movement by popular imagination to account for the marked bias towards an ecclesiastical career which seems to have characterized the early boyhood of the future champion of the Faith. Sozomen speaks of his “fitness for the priesthood”, and calls attention to the significant circumstance that he was “from his tenderest years practically self-taught”. “Not long after this,” adds the same authority, the Bishop Alexander “invited Athanasius to be his commensal and secretary. He had been well educated, and was versed in grammar and rhetoric, and had already, while still a young man, and before reaching the episcopate, given proof to those who dwelt with him of his wisdom and acumen” (Soz., II, xvii). That “wisdom and acumen” manifested themselves in a various environment. While still a levite under Alexander’s care, he seems to have been brought for a while into close relations with some of the solitaries of the Egyptian desert, and in particular with the great St. Anthony, whose life he is said to have written. The evidence both of the intimacy and for the authorship of the life in question has been challenged, chiefly by non-Catholic writers, on the ground that the famous “Vita” shows signs of interpolation. Whatever we may think of the arguments on the subject, it is impossible to deny that the monastic idea appealed powerfully to the young cleric’s temperament, and that he himself in after years was not only at home when duty or accident threw him among the solitaries, but was so monastically self-disciplined in his habits as to be spoken of as an “ascetic” (Apol. c. Arian., vi). In fourth-century usage the word would have a definiteness of connotation not easily determinable today. It is not surprising that one who was called to fill so large a place in the history of his time should have impressed the very form and feature of his personality, so to say, upon the imagination of his contemporaries. St. Gregory Nazianzen is not the only writer who has described him for us (Orat. xxi, 8). A contemptuous phrase of the Emperor Julian’s (Epist., li) serves unintentionally to corroborate the picture drawn by kindlier observers. He was slightly below the middle height, spare in build, but well-knit, and intensely energetic. He had a finely shaped head, set off with a thin growth of auburn hair, a small but sensitively mobile mouth, an aquiline nose, and eyes of intense but kindly brilliancy. He had a ready wit, was quick in intuition, easy and affable in manner, pleasant in conversation, keen, and, perhaps, somewhat too unsparing in debate. (Besides the references already cited, see the detailed description given in the January Menaion quotes in the Bollandist life. Julian the Apostate, in the letter alluded to above sneers at the diminutiveness of his person — mede aner, all anthropiokos euteles, he writes.) In addition to these qualities, he was conspicuous for two others to which even his enemies bore unwilling testimony. He was endowed with a sense of humour that could be as mordant — we had almost said as sardonic — as it seems to have been spontaneous and unfailing; and his courage was of the sort that never falters, even in the most disheartening hour of defeat. There is one other note in this highly gifted and many-sided personality to which everything else in his nature literally ministered, and which must be kept steadily in view, if we would possess the key to his character and writing and understand the extraordinary significance of his career in the history of the Christian Church. He was by instinct neither a liberal nor a conservative in theology. Indeed the terms have a singular inappropriateness as applied to a temperament like his. From first to last he cared greatly for one thing and one thing only; the integrity of his Catholic creed. The religion it engendered in him was obviously — considering the traits by which we have tried to depict him — of a passionate and consuming sort. It began and ended in devotion to the Divinity of Jesus Christ. He was scarcely out of his teens, and certainly not in more than deacon’s orders, when he published two treatises, in which his mind seemed to strike the keynote of all its riper after-utterances on the subject of the Catholic Faith. The “Contra Gentes” and the “Oratio de Incarnatione” — to give them the Latin appellations by which they are more commonly cited — were written some time between the years 318 and 323. St. Jerome (De Viris Illust.) refers to them under a common title, as “Adversum Gentes Duo Libri”, thus leaving his readers to gather the impression which an analysis of the contents of both books certainly seems to justify, that the two treatises are in reality one. As a plea for the Christian position, addressed chiefly to both Gentiles and Jews, the young deacon’s apology, while undoubtedly reminiscential in methods and ideas of Origen and the earlier Alexandrians, is, nevertheless, strongly individual and almost pietistic in tone. Though it deals with the Incarnation, it is silent on most of those ulterior problems in defence of which Athanasius was soon to be summoned by the force of events and the fervour of his own faith to devote the best energies of his life. The work contains no explicit discussion of the nature of the Word’s Sonship, for instance; no attempt to draw out the character of Our Lord’s relation to the Father; nothing, in short, of those Christological questions upon which he was to speak with such splendid and courageous clearness in time of shifting formularies and undetermined views. Yet those ideas must have been in the air (Soz., I, xv) for, some time between the years 318 and 320, Arius, a native of Libya (Epiph., Haer., lxix) and priest of the Alexandrian Church, who had already fallen under censure for his part in the Meletian troubles which broke out during the episcopate of St. Peter, and whose teachings had succeeded in making dangerous headway, even among “the consecrated virgins” of St. Mark’s see (Epiph. Haer., lxix; Soc., Hist. Eccl., I, vi), accused Bishop Alexander of Sabellianism. Arius, who seems to have presumed on the charitable tolerance of the primate, was at length deposed (Apol. c. Ar., vi) in a synod consisting of more than one hundred bishops of Egypt and Libya (Depositio Ar., 3). The condemned heresiarch withdrew first to Palestine and afterwards to Bithynia, where, under the protection of Eusebius of Nicomedia and his other “Collucianists”, he was able to increase his already remarkable influence, while his friends were endeavouring to prepare a way for his forcible reinstatement as priest of the Alexandrian Church. Athanasius, though only in deacon’s order, must have taken no subordinate part in these events. He was the trusted secretary and advisor of Alexander, and his name appears in the list of those who signed the encyclical letter subsequently issued by the primate and his colleagues to offset the growing prestige of the new teaching, and the momentum it was beginning to acquire from the ostentatious patronage extended to the deposed Arius by the Eusebian faction. Indeed, it is to this party and to the leverage it was able to exercise at the emperor’s court that the subsequent importance of Arianism as a political, rather than a religious, movement seems primarily to be due. The heresy, of course, had its supposedly philosophic basis, which has been ascribed by authors, ancient and modern, to the most opposite sources. St. Epiphanius characterizes it as a king of revived Aristoteleanism (Haer., lxvii and lxxvi); and the same view is practically held by Socrates (Hist. Eccl., II, xxxv), Theodoret (Haer. Fab., IV, iii), and St. Basil (Adv. Eunom., I, ix). On the other hand, a theologian as broadly read as Petavius (De Trin., I, viii, 2) has no hesitation in deriving it from Platonism; Newman in turn (Arians of the Fourth Cent., 4 ed., 109) sees in it the influence of Jewish prejudices rationalized by the aid of Aristotelean ideas; while Robertson (Sel. Writ. and Let. of Ath. Proleg., 27) observes that the “common theology”, which was invariably opposed to it, “borrowed its philosophical principles and method from the Platonists.” These apparently conflicting statements could, no doubt, be easily adjusted; but the truth is that the prestige of Arianism never lay in its ideas. From whatever school it may have been logically derived, the sect, as a sect, was cradled and nurtured in intrigue. Save in some few instances, which can be accounted for on quite other grounds, its prophets relied more upon curial influence than upon piety, or Scriptural knowledge, or dialectics. That must be borne constantly in mind, if we would not move distractedly through the bewildering maze of events that make up the life of Athanasius for the next half-century to come. It is his peculiar merit that he not only saw the drift of things from the very beginning, but was confident of the issue down to the last (Apol. c. Ar., c.). His insight and courage proved almost as efficient a bulwark to the Christian Church in the world as did his singularly lucid grasp of traditional Catholic belief. His opportunity came in the year 325, when the Emperor Constantine, in the hope of putting an end to the scandalous debates that were disturbing the peace of the Church, met the prelates of the entire Catholic world in council at Nicaea. The great council convoked at this juncture was something more than a pivotal event in the history of Christianity. Its sudden, and, in one sense, almost unpremeditated adoption of a quasi-philosophic and non-Scriptural term — homoousion — to express the character of orthodox belief in the Person of the historic Christ, by defining Him to be identical in substance, or co-essential, with the Father, together with its confident appeal to the emperor to lend the sanction of his authority to the decrees and pronouncements by which it hoped to safeguard this more explicit profession of the ancient Faith, had consequences of the gravest import, not only to the world of ideas, but to the world of politics as well. 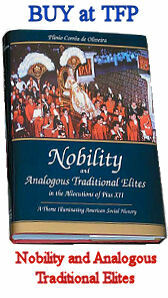 By the official promulgation to the term homoöusion, theological speculation received a fresh but subtle impetus which made itself felt long after Athanasius and his supporters had passed away; while the appeal to the secular arm inaugurated a policy which endured practically without change of scope down to the publication of the Vatican decrees in our own time. In one sense, and that a very deep and vital one, both the definition and the policy were inevitable. It was inevitable in the order of religious ideas that any break in logical continuity should be met by inquiry and protest. It was just as inevitable that the protest, to be effective, should receive some countenance from a power which up to that moment had affected to regulate all the graver circumstances of life (cf. Harnack, Hist. Dog., III, 146, note; Buchanan’s tr.). As Newman has remarked: “The Church could not meet together in one, without entering into a sort of negotiation with the power that be; who jealousy it is the duty of Christians, both as individuals and as a body, if possible, to dispel” (Arians of the Fourth Cent., 4 ed., 241). Athanasius, though not yet in priest’s orders, accompanied Alexander to the council in the character of secretary and theological adviser. He was not, of course, the originator of the famous homoösion. The term had been proposed in a non-obvious and illegitimate sense by Paul of Samosata to the Father at Antioch, and had been rejected by them as savouring of materialistic conceptions of the Godhead (cf. Athan., “De Syn.,” xliii; Newman, “Arians of the Fourth Cent.,” 4 ed., 184-196; Petav. “De Trin.,” IV, v, sect. 3; Robertson, “Sel. Writ. and Let. Athan. Proleg.”, 30 sqq.). It may even be questioned whether, if left to his own logical instincts, Athanasius would have suggested an orthodox revival of the term at all (“De Decretis”, 19; “Orat. c. Ar.”, ii, 32; “Ad Monachos”, 2). His writings, composed during the forty-six critical years of his episcopate, show a very sparing use of the word; and though, as Newman (Arians of the Fourth Cent., 4 ed., 236) reminds us, “the authentic account of the proceedings” that took place is not extant, there is nevertheless abundant evidence in support of the common view that it had been unexpectedly forced upon the notice of the bishops, Arian and orthodox, in the great synod by Constantine’s proposal to account the creed submitted by Eusebius of Caesarea, with the addition of the homoösion, as a safeguard against possible vagueness. The suggestion had in all probability come from Hosius (cf. “Epist. Eusebii.”, in the appendix to the “De Decretis”, sect. 4; Soc., “Hist. Eccl.”, I, viii; III, vii; Theod. “Hist. Eccl.”, I, Athan. 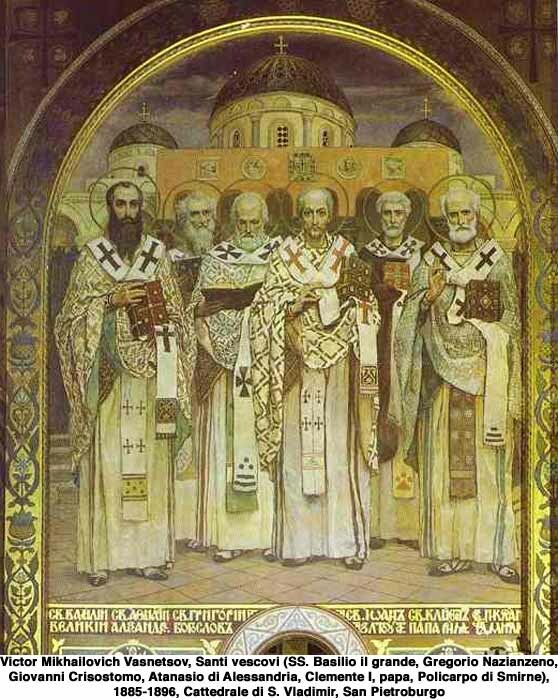 ; “Arians of the Fourth Cent.”, 6, n. 42; outos ten en Nikaia pistin exetheto, says the saint, quoting his opponents); but Athanasius, in common with the leaders of the orthodox party, loyally accepted the term as expressive of the traditional sense in which the Church had always held Jesus Christ to be the Son of God. The conspicuous abilities displayed in the Nicaean debates and the character for courage and sincerity he won on all sides made the youthful cleric henceforth a marked man (St. Greg. Naz., Orat., 21). His life could not be lived in a corner. Five months after the close of the council the Primate of Alexandria died; and Athanasius, quite as much in recognition of his talent, it would appear, as in deference to the deathbed wishes of the deceased prelate, was chosen to succeed him. His election, in spite of his extreme youth and the opposition of a remnant of the Arian and Meletian factions in the Alexandrian Church, was welcomed by all classes among the laity (“Apol. c. Arian”, vi; Soz., “Hist. Eccl.”, II, xvii, xxi, xxii). The opening years of the saint’s rule were occupied with the wonted episcopal routine of a fourth-century Egyptian bishop. Episcopal visitations, synods, pastoral correspondence, preaching and the yearly round of church functions consumed the bulk of his time. The only noteworthy events of which antiquity furnishes at least probable data are connected with the successful efforts which he made to provide a hierarchy for the newly planted church in Ethiopia (Abyssinia) in the person of St. Frumentius (Rufinus I, ix; Soc. I, xix; Soz., II, xxiv), and the friendship which appears to have begun about this time between himself and the monks of St. Pachomius. But the seeds of disaster which the saint’s piety had unflinchingly planted at Nicaea were beginning to bear a disquieting crop at last. Already events were happening at Constantinople which were soon to make him the most important figure of his time. 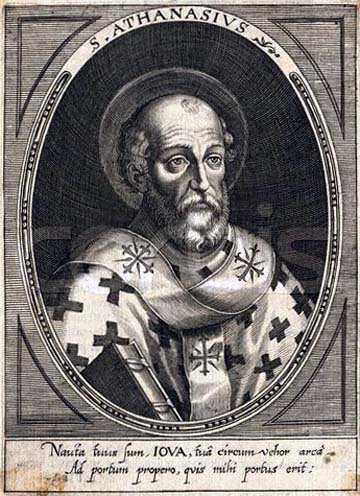 Eusebius of Nicomedia, who had fallen into disgrace and been banished by the Emperor Constantine for his part in the earlier Arian controversies, had been recalled from exile. After an adroit campaign of intrigue, carried on chiefly through the instrumentality of the ladies of the imperial household, this smooth-mannered prelate so far prevailed over Constantine as to induce him to order the recall of Arius likewise from exile. He himself sent a characteristic letter to the youthful Primate of Alexandria, in which he bespoke his favour for the condemned heresiarch, who was described as a man whose opinions had been misrepresented. These events must have happened some time about the close of the year 330. Finally the emperor himself was persuaded to write to Athanasius, urging that all those who were ready to submit to the definitions of Nicaea should be re-admitted to ecclesiastical communion. This Athanasius stoutly refused to do, alleging that there could be no fellowship between the Church and the one who denied the Divinity of Christ. The Bishop of Nicomedia thereupon brought various ecclesiastical and political charges against Athanasius, which, though unmistakably refuted at their first hearing, were afterwards refurbished and made to do service at nearly every stage of his subsequent trials. Four of these were very definite, to wit: that he had not reached the canonical age at the time of his consecration; that he had imposed a linen tax upon the provinces; that his officers had, with his connivance and authority, profaned the Sacred Mysteries in the case of an alleged priest names Ischyras; and lastly that he had put one Arenius to death and afterwards dismembered the body for purposes of magic. The nature of the charges and the method of supporting them were vividly characteristic of the age. The curious student will find them set forth in picturesque detail in the second part of the Saint’s “Apologia”, or “Defense against the Arians”, written long after the events themselves, about the year 350, when the retractation of Ursacius and Valens made their publication triumphantly opportune. The whole unhappy story at this distance of time reads in parts more like a specimen of late Greek romance than the account of an inquisition gravely conducted by a synod of Christian prelates with the idea of getting at the truth of a series of odious accusations brought against one of their number. Summoned by the emperor’s order after protracted delays extended over a period of thirty months (Soz., II, xxv), Athanasius finally consented to meet the charges brought against him by appearing before a synod of prelates at Tyre in the year 335. Fifty of his suffragans went with him to vindicate his good name; but the complexion of the ruling party in the synod made it evident that justice to the accused was the last thing that was thought of. It can hardly be wondered at, that Athanasius should have refused to be tried by such a court. He, therefore, suddenly withdrew from Tyre, escaping in a boat with some faithful friends who accompanied him to Byzantium, where he had made up his mind to present himself to the emperor. The circumstances in which the saint and the great catechumen met were dramatic enough. Constantine was returning from a hunt, when Athanasius unexpectedly stepped into the middle of the road and demanded a hearing. The astonished emperor could hardly believe his eyes, and it needed the assurance of one of the attendants to convince him that the petitioner was not an impostor, but none other than the great Bishop of Alexandria himself. “Give me”, said the prelate, “a just tribunal, or allow me to meet my accusers face to face in your presence.” His request was granted. An order was peremptorily sent to the bishops, who had tried Athanasius and, of course, condemned him in his absence, to repair at once to the imperial city. The command reached them while they were on their way to the great feast of the dedication of Constantine’s new church at Jerusalem. It naturally caused some consternation; but the more influential members of the Eusebian faction never lacked either courage or resourcefulness. The saint was taken at his word; and the old charges were renewed in the hearing of the emperor himself. Athanasius was condemned to go into exile at Treves, where he was received with the utmost kindness by the saintly Bishop Maximinus and the emperor’s eldest son, Constantine. He began his journey probably in the month of February, 336, and arrived on the banks of the Moselle in the late autumn of the same year. His exile lasted nearly two years and a half. Public opinion in his own diocese remained loyal to him during all that time. It was not the least eloquent testimony to the essential worth of his character that he could inspire such faith. Constantine’s treatment of Athanasius at this crisis in his fortunes has always been difficult to understand. Affecting, on the one hand, a show of indignation, as if he really believed in the political charge brought against the saint, he, on the other hand, refused to appoint a successor to the Alexandrian See, a thing which he might in consistency have been obliged to do had he taken seriously the condemnation proceedings carried through by the Eusebians at Tyre. Meanwhile events of the greatest importance had taken place. Arius had died amid startlingly dramatic circumstances at Constantinople in 336; and the death of Constantine himself had followed, on the 22nd of May the year after. Some three weeks later the younger Constantine invited the exiled primate to return to his see; and by the end of November of the same year Athanasius was once more established in his episcopal city. His return was the occasion of great rejoicing. The people, as he himself tells us, ran in crowds to see his face; the churches were given over to a kind of jubilee; thanksgivings were offered up everywhere; and clergy and laity accounted the day the happiest in their lives. But already trouble was brewing in a quarter from which the saint might reasonably have expected it. The Eusebian faction, who from this time forth loom large as the disturbers of his peace, managed to win over to their side the weak-minded Emperor Constantius to whom the East had been assigned in the division of the empire that followed on the death of Constantine. The old charges were refurbished with a graver ecclesiastical accusation added by way of rider. Athanasius had ignored the decision of a duly authorized synod. He had returned to his see without the summons of ecclesiastical authority (Apol. c. Ar., loc. cit.). In the year 340, after the failure of the Eusebian malcontents to secure the appointment of an Arian candidate of dubious reputation names Pistus, the notorious Gregory of Cappadocia was forcibly intruded into the Alexandrian See, and Athanasius was obliged to go into hiding. Within a very few weeks he set out for Rome to lay his case before the Church at large. He had made his appeal to Pope Julius, who took up his cause with a whole-heartedness that never wavered down to the day of that holy pontiff’s death. The pope summoned a synod of bishops to meet in Rome. After a careful and detailed examination of the entire case, the primate’s innocence was proclaimed to the Christian world. Meanwhile the Eusebian party had met at Antioch and passed a series of decrees framed for the sole purpose of preventing the saint’s return to his see. Three years were passed at Rome, during which time the idea of the cenobitical life, as Athanasius had seen it practised in the deserts of Egypt, was preached to the clerics of the West (St. Jerome, Epistle cxxvii, 5). Two years after the Roman synod had published its decision, Athanasius was summoned to Milan by the Emperor Constans, who laid before him the plan which Constantius had formed for a great reunion of both the Eastern and Western Churches. Now began a time of extraordinary activity for the Saint. Early in the year 343 we find the undaunted exile in Gaul, whither he had gone to consult the saintly Hosius, the great champion of orthodoxy in the West. The two together set out for the Council of Sardica which had been summoned in deference to the Roman pontiff’s wishes. At this great gathering of prelates the case of Athanasius was taken up once more; and once more was his innocence reaffirmed. Two conciliar letters were prepared, one to the clergy and faithful of Alexandria, and the other to the bishops of Egypt and Libya, in which the will of the Council was made known. Meanwhile the Eusebian party had gone to Philippopolis, where they issued an anathema against Athanasius and his supporters. The persecution against the orthodox party broke out with renewed vigour, and Constantius was induced to prepare drastic measures against Athanasius and the priests who were devoted to him. 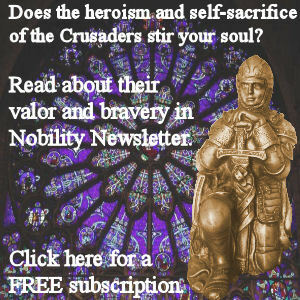 Orders were given that if the Saint attempted to re-enter his see, he should be put to death. 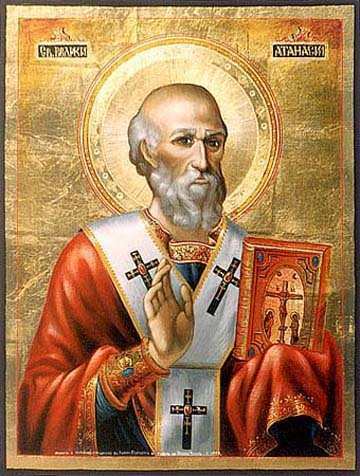 Athanasius, accordingly, withdrew from Sardica to Naissus in Mysia, where he celebrated the Easter festival of the year 344. After that he set out for Aquileia in obedience to a friendly summons from Constans, to whom Italy had fallen in the division of the empire that followed on the death of Constantine. Meanwhile an unexpected event had taken place which made the return of Athanasius to his see less difficult than it had seemed for many months. Gregory of Cappadocia had died (probably of violence) in June, 345. The embassy which had been sent by the bishops of Sardica to the Emperor Constantius, and which had at first met with the most insulting treatment, now received a favourable hearing. Constantius was induced to reconsider his decision, owing to a threatening letter from his brother Constans and the uncertain condition of affairs of the Persian border, and he accordingly made up his mind to yield. But three separate letters were needed to overcome the natural hesitation of Athanasius. He passed rapidly from Aquileia to Treves, from Treves to Rome, and from Rome by the northern route to Adrianople and Antioch, where he met Constantius. He was accorded a gracious interview by the vacillating Emperor, and sent back to his see in triumph, where he began his memorable ten years’ reign, which lasted down to the third exile, that of 356. These were full years in the life of the Bishop; but the intrigues of the Eusebian, or Court, party were soon renewed. Pope Julius had died in the month of April, 352, and Liberius had succeeded him as Sovereign Pontiff. For two years Liberius had been favourable to the cause of Athanasius; but driven at last into exile, he was induced to sign an ambiguous formula, from which the great Nicene test, the homoöusion, had been studiously omitted. In 355 a council was held at Milan, where in spite of the vigorous opposition of a handful of loyal prelates among the Western bishops, a fourth condemnation of Athanasius was announced to the world. With his friends scattered, the saintly Hosius in exile, the Pope Liberius denounced as acquiescing in Arian formularies, Athanasius could hardly hope to escape. On the night of 8 February, 356, while engaged in services in the Church of St. Thomas, a band of armed men burst in to secure his arrest (Apol. de Fuga, 24). It was the beginning of his third exile. Through the influence of the Eusebian faction at Constantinople, an Arian bishop, George of Cappadocia, was now appointed to rule the see of Alexandria. Athanasius, after remaining some days in the neighbourhood of the city, finally withdrew into the deserts of upper Egypt, where he remained for a period of six years, living the life of the monks and devoting himself in his enforced leisure to the composition of that group of writings of which we have the rest in the “Apology to Constantius”, the “Apology for his Flight”, the “Letter to the Monks”, and the “History of the Arians”. Legend has naturally been busy with this period of the Saint’s career; and we may find in the “Life of Pachomius” a collection of tales brimful of incidents, and enlivened by the recital of “deathless ‘scapes in the breach.” But by the close of the year 360 a change was apparent in the complexion of the anti-Nicene party. The Arians no longer presented an unbroken front to their orthodox opponents. The Emperor Constantius, who had been the cause of so much trouble, died 4 November, 361, and was succeeded by Julian. 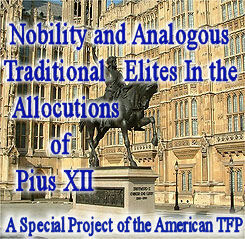 The proclamation of the new prince’s accession was the signal for a pagan outbreak against the still dominant Arian faction in Alexandria. George, the usurping Bishop, was flung into prison and murdered amid circumstances of great cruelty, 24 December (Hist. Aceph., VI). An obscure presbyter of the name of Pistus was immediately chosen by the Arians to succeed him, when fresh news arrived that filled the orthodox party with hope. 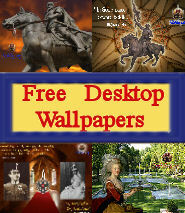 An edict had been put forth by Julian (Hist. Aceph., VIII) permitting the exiled bishops of the “Galileans” to return to their “towns and provinces”. Athanasius received a summons from his own flock, and he accordingly re-entered his episcopal capital 22 February, 362. With characteristic energy he set to work to re-establish the somewhat shattered fortunes of the orthodox party and to purge the theological atmosphere of uncertainty. To clear up the misunderstandings that had arisen in the course of the previous years, an attempt was made to determine still further the significance of the Nicene formularies. In the meanwhile, Julian, who seems to have become suddenly jealous of the influence that Athanasius was exercising at Alexandria, addressed an order to Ecdicius, the Prefect of Egypt, peremptorily commanding the expulsion of the restored primate, on the ground that he had never been included in the imperial act of clemency. The edict was communicated to the bishop by Pythicodorus Trico, who, though described in the “Chronicon Athanasianum” (xxxv) as a “philosopher”, seems to have behaved with brutal insolence. On 23 October the people gathered about the proscribed bishop to protest against the emperor’s decree; but the saint urged them to submit, consoling them with the promise that his absence would be of short duration. The prophecy was curiously fulfilled. Julian terminated his brief career 26 June, 363; and Athanasius returned in secret to Alexandria, where he soon received a document from the new emperor, Jovian, reinstating him once more in his episcopal functions. His first act was to convene a council which reaffirmed the terms of the Nicene Creed. Early in September he set out for Antioch, bearing a synodal letter, in which the pronouncements of this council had been embodied. At Antioch he had an interview with the new emperor, who received him graciously and even asked him to prepare an exposition of the orthodox faith. But in the following February Jovian died; and in October, 364, Athanasius was once more an exile. 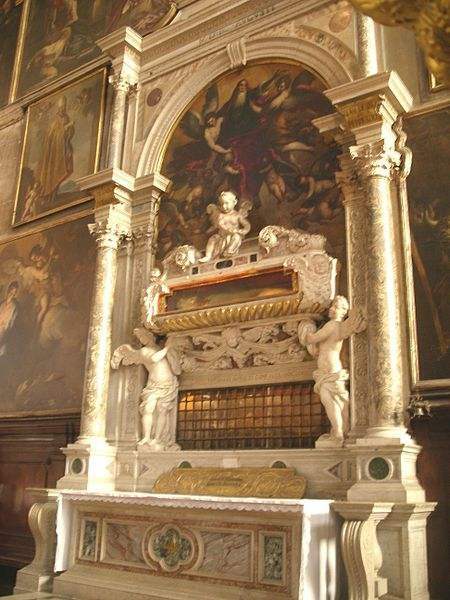 Double reliquary with the tomb of St. Zechariah, father of John the Baptist and Saint Athanasius in the Church of San Zaccaria Venice. With the turn of circumstances that handed over to Valens the control of the East this article has nothing to do; but the accession of the emperor gave a fresh lease of life to the Arian party. He issued a decree banishing the bishops who has been deposed by Constantius, but who had been permitted by Jovian to return to their sees. The news created the greatest consternation in the city of Alexandria itself, and the prefect, in order to prevent a serious outbreak, gave public assurance that the very special case of Athanasius would be laid before the emperor. But the saint seems to have divined what was preparing in secret against him. He quietly withdrew from Alexandria, 5 October, and took up his abode in a country house outside the city. It was during this period that he is said to have spent four months in hiding in his father’s tomb (Soz., “Hist. Eccl.”, VI, xii; Doc., “Hist. Eccl.”, IV, xii). Valens, who seems to have sincerely dreaded the possible consequences of a popular outbreak, gave order within a very few weeks for the return of Athanasius to his see. And now began that last period of comparative repose which unexpectedly terminated his strenuous and extraordinary career. He spent his remaining days, characteristically enough, in re-emphasizing the view of the Incarnation which had been defined at Nicaea and which has been substantially the faith of the Christian Church from its earliest pronouncement in Scripture down to its last utterance through the lips of Pius X in our own times. “Let what was confessed by the Fathers of Nicaea prevail”, he wrote to a philosopher-friend and correspondent in the closing years of his life (Epist. lxxi, ad Max.). That that confession did at last prevail in the various Trinitarian formularies that followed upon that of Nicaea was due, humanly speaking, more to his laborious witness than to that of any other champion in the long teachers’ roll of Catholicism. By one of those inexplicable ironies that meet us everywhere in human history, this man, who had endured exile so often, and risked life itself in defence of what he believed to be the first and most essential truth of the Catholic creed, died not by violence or in hiding, but peacefully in his own bed, surrounded by his clergy and mourned by the faithful of the see he had served so well. His feast in the Roman Calendar is kept on the anniversary of his death. All the essential materials for the Saint’s biography are to be found in his writings, especially in those written after the year 350, when the Apologia contra Arianos was composed. Supplementary information will be found in ST. EPIPHANIUS, Hoer., loc. cit. ; in ST. GREGORY OF NAZIANZUS, Orat., xxi; also RUFINUS, SOCRATES, SOZMEN, and THEODORET. The Historia Acephala, or Maffeian Fragment (discovered by Maffei in 1738, and inserted by GALLANDI in Bibliotheca Patrum, 1769), and the Chronicon Athanasianum, or Index to the Festal Letters, give us data for the chronological problem. 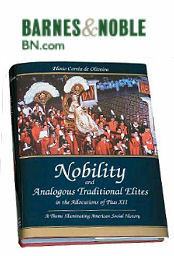 All the foregoing sources are included in MIGNE, P. G. and P. L. The great PAPEBROCH’S Life is in the Acta SS., May, I. The most important authorities in English are: NEWMAN, Arians of the Fourth Century, and Saint Athanasius; BRIGHT, Dictionary of Christian Biography; ROBERTSON, Life, in the Prolegomena to the Select Writings and Letters of Saint Athanasius (re-edited in Library of the Nicene and post-Nicene Fathers, New York, 1903); GWATKIN, Studies of Arianism (2d ed., Cambridge, 1900); MOHLER, Athanasius der Grosse; HERGENROTHER and HEFELE.